I realize a week is a lot of time to wait for a drum corps post. By now, the summer tour has wended its way far from my southern encounter, inching ever closer to next weekend's finals in Indianapolis. But a week ago, on the Sunday and Monday that flanked the July-August threshold, I got out of the summer's relative drum corps radio silence on my part and into a couple of shows in North Carolina and Virginia. I had opined philosophically - on multiple occasions - about how Wake Forest's BB&T Field was the ideal location for NightBEAT, but hadn't fully experienced it in reality until a week ago. As previously stated, there is a formidable case for leaving the event in Winston full time. One of the first things I noticed this year - which may have been in place last year, but our schedule kept us from realizing - is that NightBEAT is far more of an event in Winston-Salem than it is in Charlotte. It's a similar argument to keeping the ACC men's basketball tournament in Greensboro instead of larger metros: While events can get swallowed up in larger cities, the smaller ones can truly roll out the red carpet. In Charlotte, the event wasn't even in the area's premier stadium, while it certainly is in Winston (sorry, Bowman Gray). Heading west on I-40 into Winston, highway display signs guided "event traffic" along their way. I even wondered aloud for a moment of we were headed to the "event" of which they spoke, having never received such guidance in Charlotte, and it quickly became evident that we were. The CrownEVENTS team has never skimped on making sure this was not just a drum corps show, but an event. 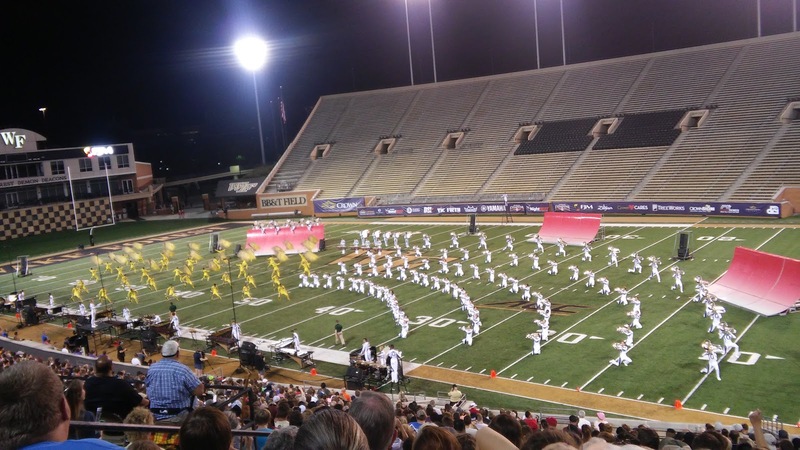 This year was no exception: The Voice's Katie Basden provided pre-show entertainment, the Commandant's Own Marine Drum and Bugle Corps returned in exhibition, and the show featured a flyover - reportedly the first in DCI history - from the Bandit Flight Team from Raleigh. As a North Carolinian of over a decade, this is where I proudly puff out my chest and note "First in Flight". 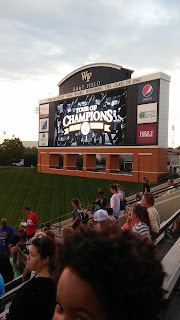 Wake Forest's stadium has a jumbotron; I haven't been in a non-finals show with one since 2004-05 in the Citrus Bowl, and I don't recall that having been used for commercials, previews, and different angles on the corps for those who chose to look. We were seated at about the 2 yard line on side 2; until the kids are older and can sit more still, we opt for the cheap seats. In ACC parlance, we made it through a Notre Dame conference football schedule - just five of the eight corps - before the heavens opened with a rainstorm that ultimately called the show. While we missed Crown, the Cadets, and Blue Devils, we did get to catch this year's conversation piece and current clubhouse leader, the Bluecoats. The next night, I was a single rider, driving solo up the road to Salem, VA for the Summer Music Games of Southwest Virginia. 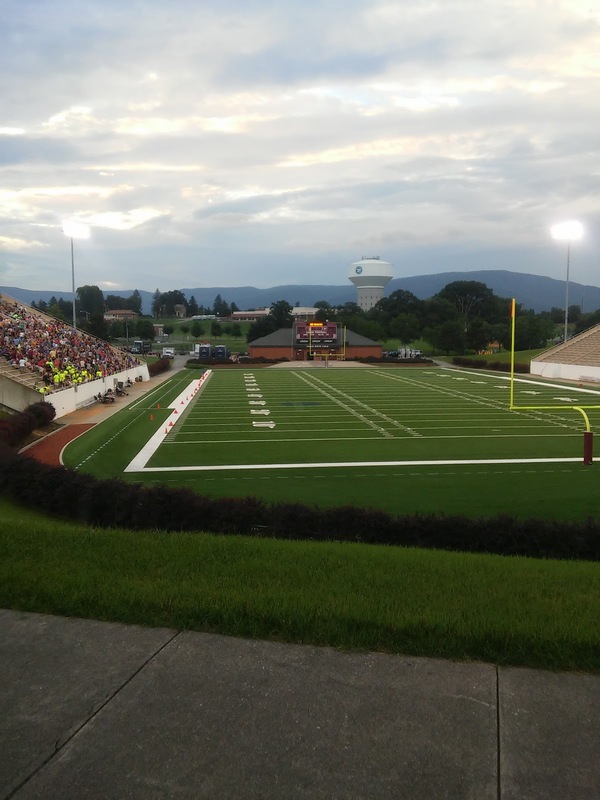 The two stadiums are night and day: NightBEAT took place in the fairly recently renovated stadium of a Power 5 team in an urban area; the Salem show was in a stadium most often used for high school football nestled in the Blue Ridge Mountains. 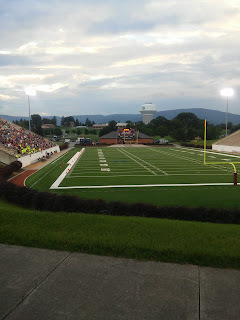 I've made the trip a few times, and Salem Football Stadium has long been one of my favorite places to watch drum corps for the scenery alone. It's also often been my chance to catch DCI's mid-majors - while I'm certainly not lamenting having a Tour of Champions show in my relative backyard, Salem's always been a chance to see what else the summer has to offer. True to form, this year's show only featured the Cavaliers of the G7 corps, while treating me to West Coast road warriors in the Mandarins and Oregon Crusaders, as well as the Blue Knights, Crossmen, Jersey Surf, and Spirit of Atlanta. I think between two nights, I might have caught every cymbal line marching DCI this summer: Santa Clara and Madison on Sunday, and Jersey Surf, Mandarins, Spirit, Oregon, and Crossmen on Monday. As a crash squad enthusiast, seven out of eleven distinct corps is not a bad haul. 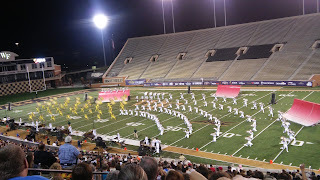 I realized that before Sunday's show I had gone over a year without seeing an actual field show: With only lots and practice last DCI season and the anomaly of no live football games last season, I hadn't seen a band/corps perform a full show in uniform since last year's Crown Preview. Remind me not to let that happen ever again.